The Conservative Intellectual Movement in America, Since 1945 essentially takes off where Russel Kirks The Conservative Mind leaves off. This is not to say it is a mere continuations of Kirk’s seminal work. 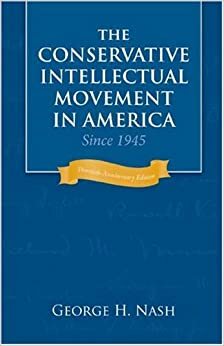 Where Kirk attempts to show conservatism’s unity by listing an unbroken line of great thinkers, starting with Edmond Burke, George Nash makes the argument that the modern conservative movement is a conglomeration of several independent lines of thought. If there is a central figure to conservatism, post WW II, to Nash it was William F. Buckley. Nonetheless, Buckley is far from alone. The undeniable influence of libertarians and classical liberals is also felt. While it is debatable if some of the characters Nash highlights truly belong in the conservative lexicon, his work proves to be an indispensable work for those seeking to understand the history of the modern conservative movement. If one wants to learn how anti-communists, disenchanted classical liberals, the religious rebirth of the 50s, agrarian southerners, neo-humanist and others contributed to conservatism this is the book to read. While important, even essential, reading to understand how modern conservative thought came into being, it is none the less a book written for intellectuals by an intellectual. For those not faint of heart, it is definitely worth delving into.